Samsung Electronics Co., Ltd., the world leader in advanced semiconductor technology, announced that it has begun mass producing 1.8-inch solid state drives at 64GB – the highest density SSD available today for mobile computing applications. said Jim Elliott, director, flash marketing, Samsung Semiconductor, Inc. The 64GB SSD use of 51nm process technology permits fabrication of much smaller components, with each chip having circuitry 1/2500th the width of a human hair. Samsung is aggressively expanding market development efforts for its SSDs. Industry wide attention on ultra-light, ultra-slim laptop PCs with flash memory based SSDs reflects early market support for this new storage medium. In addition, Samsung has already introduced 32GB SSDs into ultra-mobile personal computers (UMPCs). 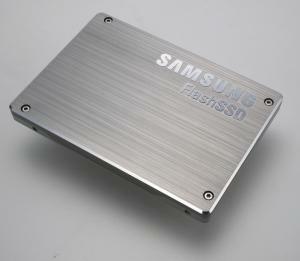 SSDs also are being considered for server applications such as in advertising and for Web search engines. Other digital consumer products such as camcorders, PDAs and printers can now be equipped with SSDs ranging from 4GB to 64GB. This new Solid State Drive from Samsung can write data at 100MB/s and read data at 120MB/s which can easily out perform most current SDDs in the market that can only write at 45MB/s and read at 65MB/s. This new Solid State Drive will come in two form factors which are: 2.5″ and 3.5″, and will be running on SATA II standard, and also it will only consume 50% less power than most current SSDs in the market. There is no information yet about how much this new Solid State Drive will cost to buy. 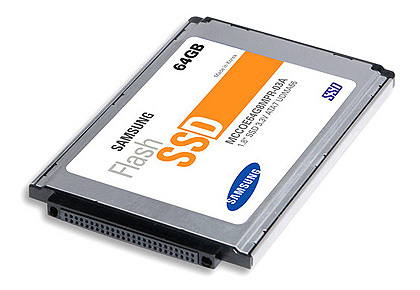 Another Samsung’s spokesperson also said that Samsung is going to develop SATA II 128GB SSD in the mid 2008.